Italy and Greece were star economic performers in 1950-1973. Average annual Italian growth was at 5% - the same as West Germany's - Italy benefited from hyperinflation during the war which cut the debt by about 75%. By 1963 the debt/GDP ratio was down to 27% in 1963.
p>As growth slowed and inflation surged following two oil price hikes in the 1970s, public spending rose and the rise was mainly paid for by borrowings — public spending as a ratio of GDP jumped from 38% in France in 1965 to 52% 20 years later; in Italy the rate rose from 34% to 51% and in the UK from 36% to 48%. In 1994 the debt reached 124% of GDP. The annual interest cost was about 11.5% of GDP. In 2000-2010, Italian growth ranked with Haiti and Zimbabwe. Superficial analysts would blame the euro but that's why they could be called superficial! In recent years Italy has achieved both trade and balance of payments surpluses in contrast with for example the UK. Italy is ranked 46 among 190 economies in the ease of doing business, according to the latest World Bank annual ratings. The rank of Italy improved to 46 in 2017 from 50 in 2016. Ease of Doing Business in Italy averaged 63.80 from 2008 until 2017, reaching an all time high of 87 in 2011 and a record low of 44 in 2014. Italy is behind Romania and Ireland’s current ranking is 17th . New Zealand, Singapore and Denmark lead. See Page 12 here. In the World Economic Forum Competitiveness Report 2017/2018 ranking of 137 countries, Ireland has a 23rd ranking behind Malaysia while Italy is at 43 behind Portugal. Switzerland, United States and Singapore, are in the lead. See Page 13 here. Italy has leading luxury goods brands and while it’s exports value as a ratio of GDP at 32% is similar to the UK’s and France’s, the trade balance has been assisted by a drop in imports because of the poor growth and earnings data. Italy recorded trade deficits from 2004 until 2011. Firms typically are small and family-owned compared with the structure in Germany and France where there are a lot more big firms. The small firms tend to also restrict management to family. Italy's spending on research and development averaged a low 1.2% of GDP annually in the period 1995-2016. In 2000, Italy spent €220 per inhabitant on R&D: France €510; Germany €620; Denmark €730 and UK €500. Italy’s employment rate at end 2017 was at 58% of the 15-64 year old population. This compared with 75% in Germany and 80% in Switzerland. One key reason for the low employment rate is the low participation of women in the workforce. Italy has among the highest shares of employed women working on Saturdays and Sundays, according to Eurostat. "It also falls on women to take care of older relatives. Over a fifth of the Italian population is aged 65 or above,­ the highest in the OECD after Japan, but adequate and accessible long-term care services for the elderly are often lacking. Holding a full-time job can be difficult if you have to take care of children and older family members with little help." 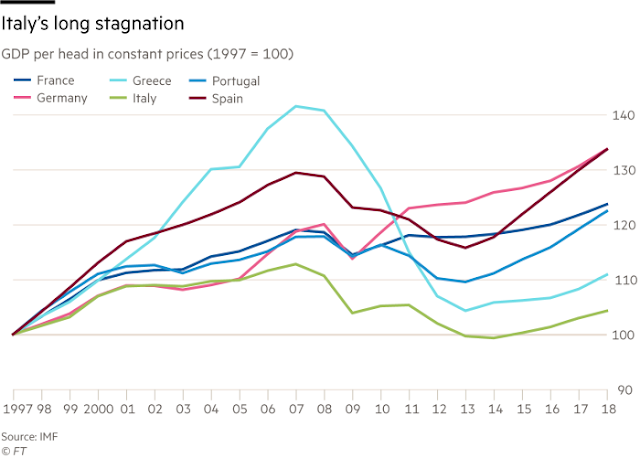 In Italy, the temptation to go back in time, or shut the door to Europe and globalisation is strong, especially after a quarter of a century of poor economic performance, argue Lorenzo Codogno and Giampaolo Galli – full post here. As to the poor economic performance, Italy’s per capita GDP stands at 106 if we put 1995 equal to 100, which means that Italy has barely grown over almost a quarter of a century. All the other OECD countries have done better, including the wretched Greece that stands at 116. 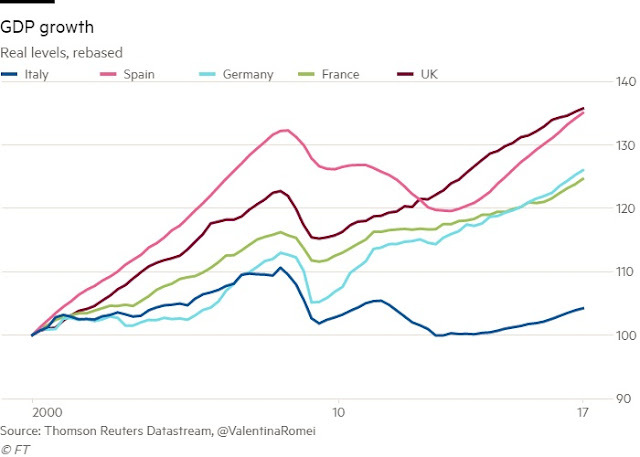 The Eurozone without Italy stands at 135, which corresponds to average annual growth of 1.4% over 1995-2017, broadly the same growth recorded in the United States. Among the other major countries, Japan was second only to Italy, but it still managed to be at 119. Thanks to a group of excellent companies, a strong export sector, and the policies introduced in recent years, the economy started to grow again in 2014, but Italy is one of the very few OECD countries that have not yet managed to recover to pre-crisis levels. 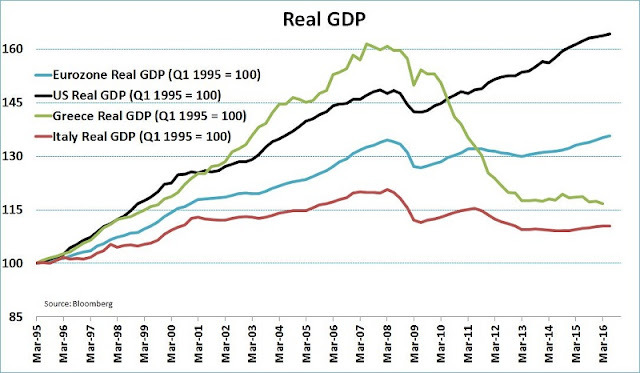 To date, GDP per capita has contracted by 8.2% compared to 2007. Almost all other countries have largely exceeded pre-crisis levels. The Eurozone net of Italy stands at 5.0 percentage points above pre-crisis levels, the United States at 6.4 points. In each of the years between 2015 and 2017, Italy recorded GDP growth about one percentage point below the other Eurozone countries. Moreover, Italy’s regional divide is huge and has not narrowed in recent years. Three other Italian economists produced research which showed that the euro did not make Italy’s economy worse. The government debt as a percentage of GDP has been above 100% since 1991 and has been on upward trend since 2004. It is now about 132%. The Interest burden has fallen from 11.5% in 1994 to 3.7% in 2017 – but the benefit of using the euro has not been used to cut debt. In recent years efforts have been made to reform public administration and public education to improve the competitiveness of its human capital. However, the investment climate remains bad mainly due to its rigid labour laws, high labour cost, an inefficient public service and a sclerotic judicial system. While foreign direct investment (FDI) has improved in recent times, the stock of FDI is the 6th lowest among 48 OECD and partner countries. Italy's Mezzogiorno region covering the southern half of the Italian peninsula combined with the islands of Sardinia and Sicily has some of the worst regional economic metrics in the European Union, including the lowest birth rate since 1862 when Italy had a total population of 22m (this number comes from Istat, the national statistics office. 26m is also cited elsewhere) compared with 61m today. The Mezzogiorno accounts for 36% of Italy's population; about 23% of national GDP and 11% of exports; the employment rate at 42% is the lowest regional rate in the EU. In the period 2009-2016, the south got just 10% of greenfield investments according to the FT.
Crime and corruption are high and 70% of tourists are domestic in the region. Italy has a big shadow / black economy and on the basis of consumption of public and private goods and services, in 2016 the individual material standard of living was above Ireland’s. The OECD’s latest net adjusted disposable income per capita is also ahead of Ireland’s. BBC Newsnight: Italy is now embarking on a political adventure that could put it at odds with the EU and the bond markets. So what lies in store for the European dream? Five Star's Manlio di Stefano and Italy's outgoing Europe Minister Sandro Gozi give their take.